In the photo, I can’t see the roof. 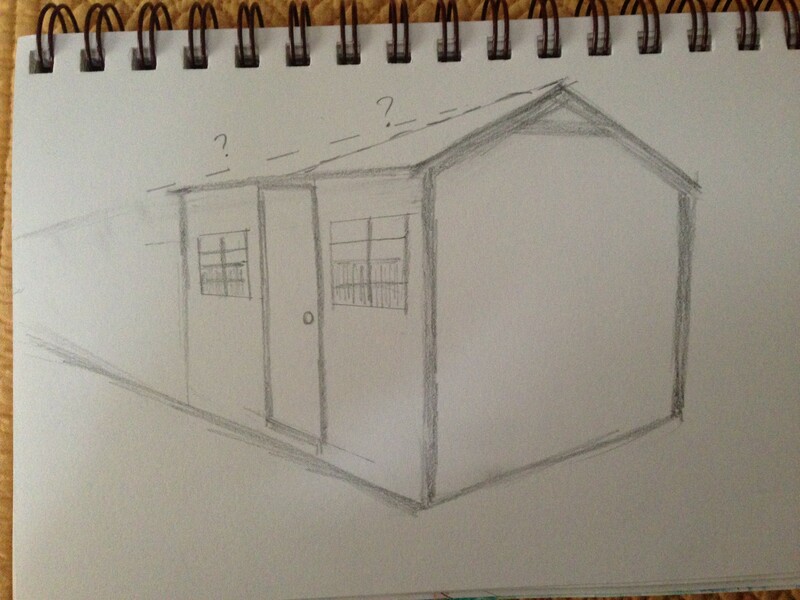 But in the drawing, the roof is obvious. I am standing very close to the shed in the photo – maybe 4-5 feet away. I’ve ordered a book about perspective through interlibrary loan. I see so many artists making art out of architecture, and until I get some kind of handle on perspective, I know that won’t be possible. If anyone has any suggestions, I’d love to hear them! So far, buildings are harder to draw than bunnies and people’s faces! I really struggle with perspective. Geometry was not my best subject. 🙂 Happy Friday! I hope everyone has a wonderful & creative weekend. Peace. Look at you learning new things ! Love it. Happy Friday! Lol or trying, anyway. Thanks. it is tricky, no question, and each situation presents a new challenge, yet after a while some situations resemble those done before and so become less tricky. 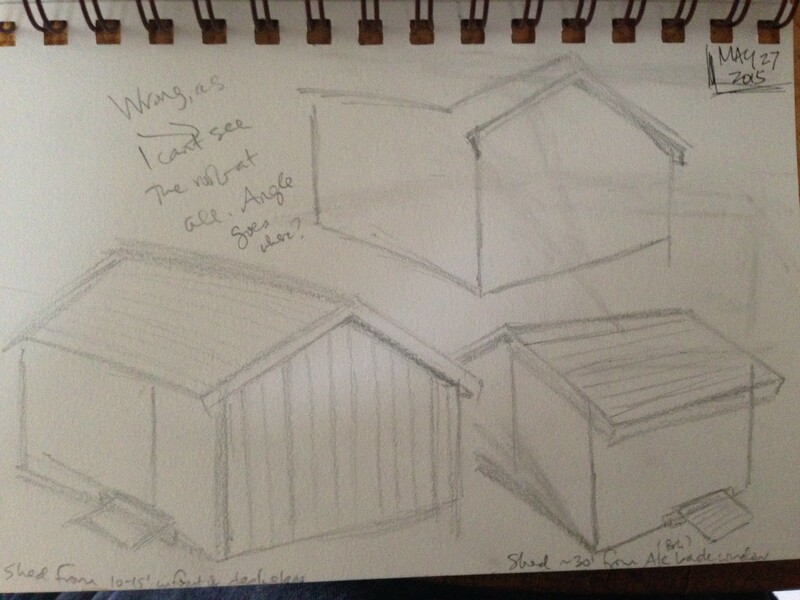 your camera has created some distortions due to its closeness to the shed, so the lines are kind of curving. this only adds more trickiness when trying to get it the way you see it. Ok, thanks Lance, and thanks for that link, which was helpful. I’ll press on. I’ve not worked much with buildings, so hopefully this gets easier as I move forward. Thanks again for your help. I remember those perspective drawings from high school. I think maybe you just need to do it a lot and then you get a feel for it. It’s not easy, and you haven’t picked an easy angle either! I remember them from high school too….I thought I remembered more than I actually do! I’ll keep on with it; thanks for the encouragement. Are you being too hard on yourself? I think these are cool. One thing i see in a few of your drawings and that I’ve seen in other drawings that I really like: a slight bowing effect. Like the drawing in the lower left of the top image: it just seems to be ballooning out ever so slightly. Intentional or not, I see it in a lot of sketches and it’s a kind of cool effect. It feels like humanity in a building, if that makes any sense. I like these sketches very much. I’m going to look at the video Lance suggested. Thanks Kirk. I erased the worst ones out of frustration. My frustration tolerance is pretty low. 🙂 I’m glad you like these. I drew them standing in front of the she’d (mostly) and holding my art journal so maybe that’s the reason for the bowing. I like your thought that it makes the bldgs more human. That’s cool. Thanks for your encouragement. Thanks Jill! You too! Will there be bunnies in your weekend? lol. I may try a chipmunk next. Perspective is hard. Just keep at it. The book will help; so will actually measuring the angle of what you see. Hold up your pencil and imagine it being along the horizontal part of the picture plane. Then, keeping it within the picture plane (don’t let it tilt forward or back), rotate it until it matches the angle of what you’re seeing. That’s the correct angle for you drawing. Also, remember that cameras distort, especially buildings. Thanks, Maggie. I will try that. You’ve explained it well I appreciate it. Interesting exercise :-). Have you tried measuring the lines and angles on the photograph with a ruler and protractor? I put a ruler from the top of the roof at the front to the back end of the roof and was surprised to find a straight line. Visual trickery! Nice! No I haven’t tried that! Perspective is incredibly hard and you are doing very well for having just started! There are also some really excellent YouTube videos on how to draw perspective (I see someone else has recommended a video, but there are many, many more good ones out there). I need to practice more, too! Always nice to try new things – you never know where it leads too. 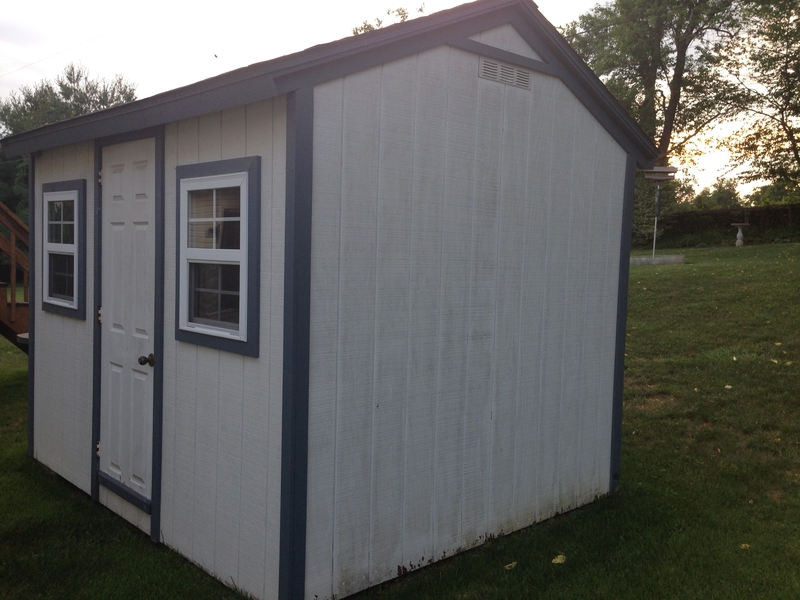 Nice perspective on your shed!! 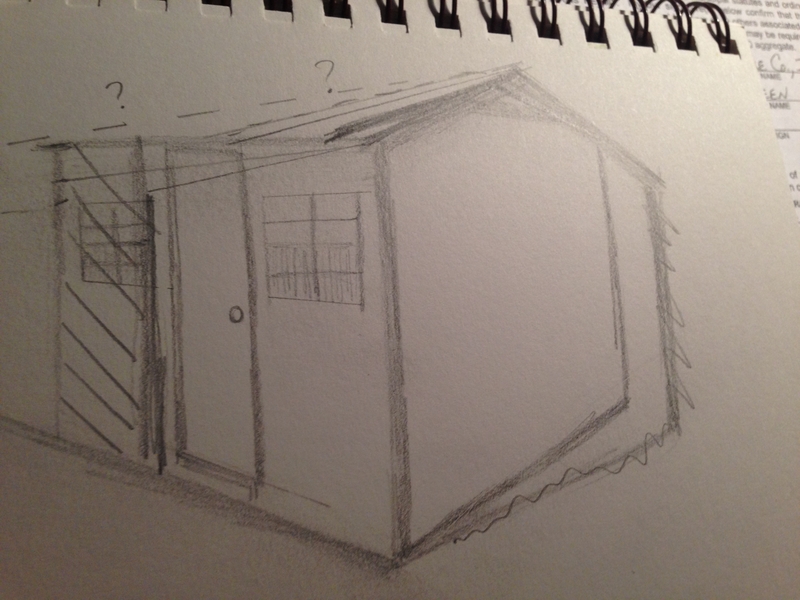 perspective drawing is so elusive….I still google instructions all the time! Thank you so much for this link and for that terrific explanation. I will try this. Thank you!